There’s a reason I used Guttentag to start this post and I’m really excited to share that reason. So lots of updates for you this week. Let’s get started. Did we make the best beer we’ve ever made? Jeremy thinks so. Detonator Dopplebock. Our best beer yet? We’ve had this German wonder (guttentag, anyone?) sitting in the fermenters since before Christmas. Yes, seriously. I’ve been wondering when Jeremy and Danny were finally going to unleash this bad boy on us. They’ve been babying this beer for 3 freaking months so I knew they were up to something with it. Either way, I got the news on Monday that they finally kegged this thing up and were ready to release it to the mug club. I was pretty excited about that. But I wasn’t nearly as excited until I get a call from Jeremy last night and his first words to me were “Dude… this dopplebock is phenomenal”. Side note: For some reason I imagined this is what Jeremy looked like after trying it. By the way… This is a stunning admission from Jeremy. Jeremy and Danny are very harsh critics of their work. I’ll try a beer from them and say “Dang! This is awesome” and both of them will be like “Yeah, but it over-attenuated for half-a-day so the ABV is off”. So for Jeremy to be excited about this beer means this is probably one of the best we’ve made so far. Guess it’s up to you to decide on Saturday, when y’all can get at it. . 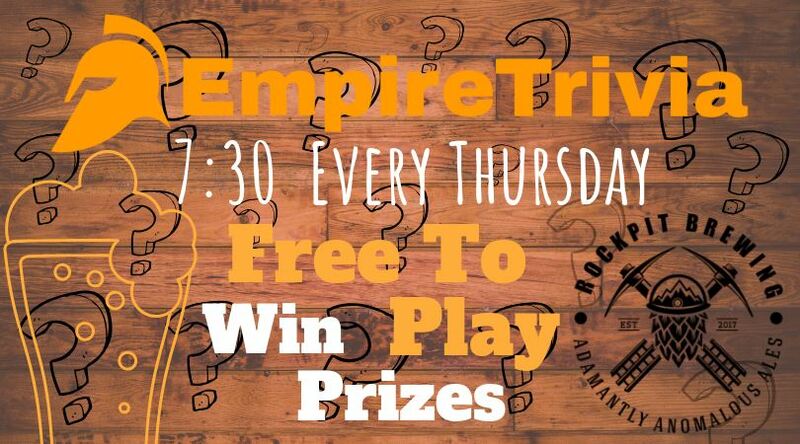 Empire Trivia was a huge hit last week. We were legit stunned about how many people were there and it was an absolute blast. Brady (the owner of Empire Trivia) knocked it out of the park. If you missed it last week, don’t miss it this week. The beer will be flowing and the prizes will be flying. With our recent unplanned outage of our three most popular beers (Sodo Blondin, Cackler and H.L.’s Pale), we had a bit of a short menu this past weekend. Luckily all three should be back on tap this weekend for you. Latest intel from Jeremy is Cackler will be ready Saturday. We MIGHT have a hard water and a few experimental New England IPA’s on tap as well, but I can’t confirm this until tomorrow. So pay attention to Facebook and Instagram for updates. Finally we have Zach Meadows coming in between 4 and 7 this Saturday. For those who weren’t lucky enough to see him in person last time, do yourself a favor and come on out. This dude has pipes. Check him on Facebook. Almost goes without saying that All March Madness games will again grace our televisions for your viewing pleasure. You’re going to start seeing more and more anomalous events from us. Seems as if every brewery does the same sort of things and we don’t want to be part of that. One of the promises we made was to be a little more anomalous. So… We have event days coming up for “National High Five Day” on April 18th and “National Pineapple Upside Down Cake Day” on April 20th. Seriously… “National High Five Day”? So here’s the deal… On National High Five day (April 18th, 2019) if you ask the bartender (or one of us owners) for a high five we’re immediately giving you a discount on your first beer. No. It’s not going to be 25 cents or something stupid like that. It will be at LEAST 35 cents. Seriously though… We’ll make it right. Second we’ll be doing a contest. Take a high five pic / video with you and whoever else (friend, spouse, dog, bird, cat, whatever) and tag us on Instagram or Facebook. Our staff will pic their favorite pic and we’ll give you an award. Still haven’t decided yet on what that might be. Most likely a gift certificate because apparently no one makes “high five” trophies that look cool (the ones on Amazon are cheesy). We’re hoping to find a suitable award but am not hopeful at this point. Hope we don’t have to default to only a gift certificate. Oh yeah… This one is even better because you get a special beer that day (April 20th, 2019). Danny is going to brew up a special, limited batch “Upside Down Pineapple Cake” berliner for that day. We’ll get the place looking a bit more tropical for y’all and maybe, just maybe, convince Cecil’s to do a special pairing that day with the beer. I can’t tell you too much for now because we haven’t confirmed anything yet. But our fingers are crossed that we’ll have something special for food that day. So that’s it for this week. Be on the lookout on the private Facebook group for the updates to the beer releases for this weekend.